Homeopathic Medicines for Amoebiasis Treatment. Amoebiasis, refers to infection caused by the amoeba Entamoeba histolytica. A gastrointestinal infection that may or may not be symptomatic and can remain latent in an infected person for several years, amoebiasis is estimated to cause 70,000 deaths per year worldwide. Symptoms can range from mild diarrhea to dysentery with blood and mucus in the stool. E. histolytica is usually a commensal organism. Severe amoebiasis infections (known as invasive or fulminant amoebiasis) occur in two major forms. Invasion of the intestinal lining causes amoebic dysentery or amoebic colitis. If the parasite reaches the bloodstream it can spread through the body, most frequently ending up in the liver where it causes amoebic liver abscesses. Liver abscesses can occur without previous development of amoebic dysentery. When no symptoms are present, the infected individual is still a carrier, able to spread the parasite to others through poor hygienic practices. The conventional treatment target to destroy the parasites and to reduce the symptoms. But after a certain period again that condition reappears. Somewhere you must have been marked in the same atmosphere some children are frequently affected by amoebiasis but some are not affected. It is because the immunity also plays a role to protect the child from getting infection. 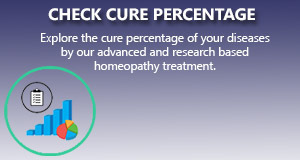 Homeopathy works at deep level to enhance the body own immune power to protect the body from getting infection. Besides that homeopathy cures the symptoms of amoebiasis in a very short spam than conventional treatment. In our Multicare homeopathy online treatment center many children with amoebiasis have benefitted using our advanced homeopathic treatment packages. We apply the most scientific and research based homeopathy treatment package for atopic dermatitis that gives a long standing cure to the ailment.